24. Pit Optimization – How I View It - KJ Kuchling Consulting Ltd.
One of the first steps in open pit mine design is the completion of a pit optimization analysis. Pit optimisation is used to define the most profitable pit shell (or nested pit shells) for a given set of economic parameters. The economic parameters generally include the metal prices, process recoveries, and operating costs. Normally when optimization is done, a range of metal prices or revenue factors is used to develop a series of nested shells to understand how the mine will expand or shrink with increasing or decreasing metal value. Once optimization is complete, the mine engineer will design a pit with benches and ramps that mimics the optimized shell as closely as possible. Depending on the slope angles used in the original optimization and where the engineer positions the haul ramps, the pit design may or may not very closely resemble the original shell. So the actual tonnage mined will be different that the tonnage defined by the optimizer. Various experts in pit optimization will use approaches of differing complexity. Some may apply variable mining costs with pit depth; apply variable recoveries link to head grade; apply variable pit slopes; etc. One can make the pit optimization step as simple or as complex as one wants it. The question is whether complex pit optimization is warranted. My view is that overly detailed pit optimization is likely not required, other than if someone wants to test the impacts of parameter sensitivity. Pit optimization can generate large pits that would have a long life. However one doesn’t know the metal prices in the future, so think about the need for high accuracy for the initial optimizations. Operating costs will change in the future, and the optimization is just a snapshot using current information. The nested smaller pits, if developed, would likely be smaller operations and have different operating costs than assumed in the original optimization. Similarly some of the larger pits may have different throughput rates and operating costs than assumed in the optimization. The ore and waste tonnages reported within the pit will be based on a specific life-of-mine cutoff grade, which again has the fixed metal price and operating cost assumptions factored in. Overall pit wall slopes may differ for shallow pits versus deep pits. Slopes may vary above the groundwater table and below it. In many instances during pit optimization the wall angles are maintained the same irrespective of the pit depth. Dilution may be applied globally during pit optimization unless one is working with a diluted block model. 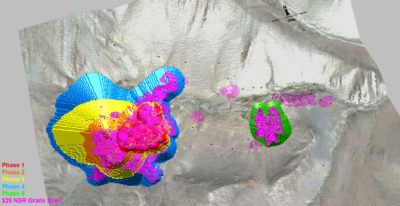 In reality, dilution may differ in different parts of the ore body, and that may not be considered in the optimization stage. For more discussion on dilution in general, read the blog “Ore Dilution Prediction – Its Always an Issue“. The bottom line is that pit optimization should be viewed as a guide to the pit design, but not as a highly precise calculation. Having said that, one should definitely understand how foreseeable changes in metal price will impact on the pit size, and then determine whether practical pushbacks are possible should metal prices increase. Tagged: Feasibility Study, Mine Engineering, Mining, Study Management. I agree wholeheartedly with your bottom line but would point out one additional necessary factor, which is a discount rate. Without it you won’t see much in terms of optimal cash flow. Over time I’ve come to realize that revenue trumps cost by a factor of about 2 to 1, so improving grade or recovery will have more impact on pit size than decreasing waste. It’s also important to note that pit optimization uses the resource model to develop pit shells, and the accuracy of the resource model must be defined before one spends a lot of time on varying bench costs or other bells and whistles. The ultimate shell will not be more precise than the model allows. I agree that the resource model is another issue to consider in optimization. If your resource model has a significant proportion of inferred ore, particularly towards the base of the block model where the pit bottom is being optimized, then there is another level of uncertainty. For a PFS or FS, inferred ore is ignored but any uncertainty in the model itself is still a factor in deciding how accurate the optimization result really is. I don’t ignore inferred when developing the pit shell but I don’t include it when calculating the reserve. That’s an interesting approach. I don’t recall seeing any PFS or FS where inferred was included in the optimization but then not included when reporting the reserve inside the pit. Usually the inferred is just flagged as waste for both optimization and reporting. Your approach does have merit. At a minimum one should run the optimization with and without inferred to see the impact that it has. It’s more common in Oz. If you have time, check out Altona. (ASX) Their DFS included work done by a group called Optiro. That’s how they did it. Under JORC 2012, you cannot include Inferred in any optimisation work when declaring Reserves. If you are, then you should be taken out the back and shot. So that is not “how we do things in Oz”!! Rather than using Optiro, maybe you should be using SRK or CSA Global.